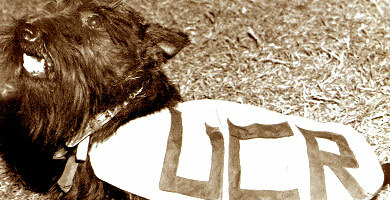 Lady Mac Tavish of Walpole, known to UCR students as Buttons, was a pedigreed Scottish Terrier who was introduced to the campus by George Beattie, UCR class of '58. Buttons was most active during the years of '55-'59 when she seldom missed a game. When UC Riverside opened in February 1954, it had classrooms, a new Physical Education Building, and a student body eager to inaugurate the new school. What it didn't have, however, was a mascot.The controversy raged throughout the opening weeks of that inaugural school year as different factions argued over what symbol should represent the newest UC school. Many wanted a bear symbol that could compete with the Bruins of UCLA and the Golden Bears of Berkeley, while others wanted to go in a completely different direction, demonstrating the independence and uniqueness of the school. A total of 67 nicknames were initially suggested by the student body. The names ran the gamut, from the wild (Bearcats, Rams, Bisons, Badgers, Gorillas) to the uninspired (Rovers, Ramblers, Possums, Chihuahuas, Valencias). There were colorful names (Red Raiders, Golden Eagles, Bluejays, Golden Beavers, Orangemen), names befitting the area's heritage and environment (Caballeros, Friars, Vaqueros, Rattlers, Scorpions, Pioneers,) and names that were, frankly, just weird (Aphids, Rocks, Bondsmen).An election in November 1954 saw none of the proposed six nicknames receive a majority and a runoff vote was scheduled. While "Cubs" was the most popular of the six, many rallied against it because it showed the campus as a "little brother" to schools like UCLA and Cal. A write-in campaign, led by the men's basketball team, was begun for the name "Hylanders," a name suggested by freshman coed Donna Lewis. The name was changed to its current spelling and won easily. In recognition of her contribution to the university, Lewis received a lifetime pass to all athletic events from student-body president Charles Young, who went on to become chancellor at UCLA. "Highlanders" fit the campus well for several reasons. The Box Springs Mountains, which stand behind the campus, were known as the Highlands. In addition, UCR has the highest elevation of any campus in the UC System. 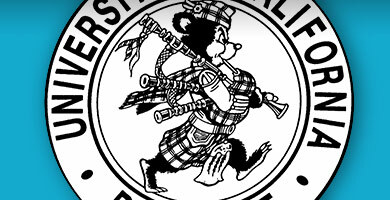 UCR Publicity Director Howard Cook had a friend create an aggressive little bear, Scotty, wearing a kilt for the school's logo, and the campus took on a Scottish flare as buildings were named after Scottish regions. The mascot went largely unchanged over the years, until 1998 when student-athletes approached the department administration and told them that they "didn't want a teddy bear in a dress" representing the Highlanders. Rather, they wanted a mascot that "looks like we are going to tear the competition apart." A bear was chosen featuring a half-blue face in homage to William Wallace, the Scottish hero and subject of the movie "Braveheart". In 2011, the mascot was updated once again. Students voted online from 13 new designs and selected a new interlocking U and C logo as well as a streamlined version of the UCR mascot, featuring a roaring Scotty wearing a plaid Tam o' Shanter. Impress your friends as you belt out the UC Riverside Alma Mater and Fight Song at a basketball game or alongside other students during a bonfire. Trust us, they'll be impressed. Get the Alma Mater and Fight Song's music sheet! 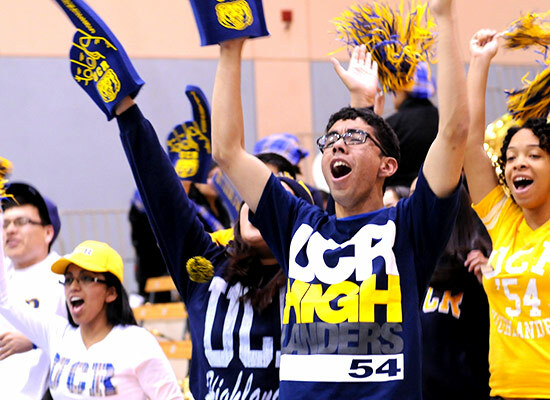 School Spirit LogoBlue and gold are the official school colors of UC Riverside. The sunburst revealed within the "R" of Riverside reflects the warmth of sunny Southern California. The present seal, designed by Tiffany and Company, has been used since 1910. The seal incorporates symbolic icons and phrases that represent the image of the University. The Chancellor's Medal The Chancellor's Medal is worn at ceremonial observances as a part of the chancellor's regalia. 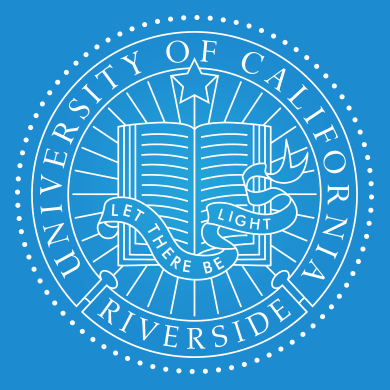 At the center is the University of California seal. The back of the medal displays the names of the campus' chancellors and year he or she was inaugurated. 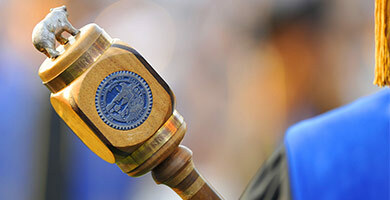 "Today, for the first time, the new mace of the University of California, Riverside is carried in academic procession. The academic mace represents the immortal dignity of the university. At great universities throughout the world, the mace symbolizes internally the authority of the university, and externally the immunity of the university to undue interference." The UC Riverside mace was hand-crafted with inlaid woods, with the head and shaft made out of Hawaiian Koa wood. The light inlaid wood is Yellow Fir from Canada, and the dark inlays are Desert Ironwood, collected by Professor Helmkamp throughout Southern California. The mace has ornaments at the top and on the base. The base is in the shape of a citrus fruit, representing UCR's Citrus Experiment Station. The top ornament is the bear of the State of California. Seals of California and the University are mounted on opposite sides of the mace's head. 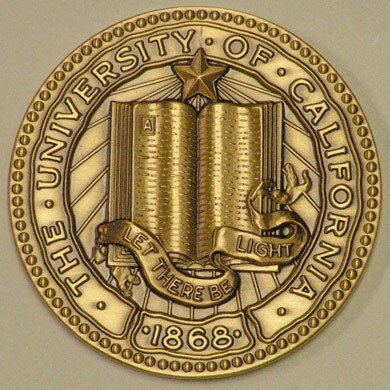 Below the seals are the mottos of California and the University, respectively, along with the years 1850 (the year California was admitted in to the Union) and 1868 (the year the University of California was founded).